Well what is there to do on a dark, misty and wet day at the end of October? The cloud base was so low even the hill tops were shrouded in a white mist, leaving only the valley floor clear. The weather was certainly not conducive to an outdoor adventure, staying at home was not an option or I would have been coerced into decorating. SOmething inside it had to be, and Aunty had an idea of an indoor and wet excursion. The last time we had been to Dan yr Ogof was over 14 years ago when Number One Daughter was younger, so time to revisit. 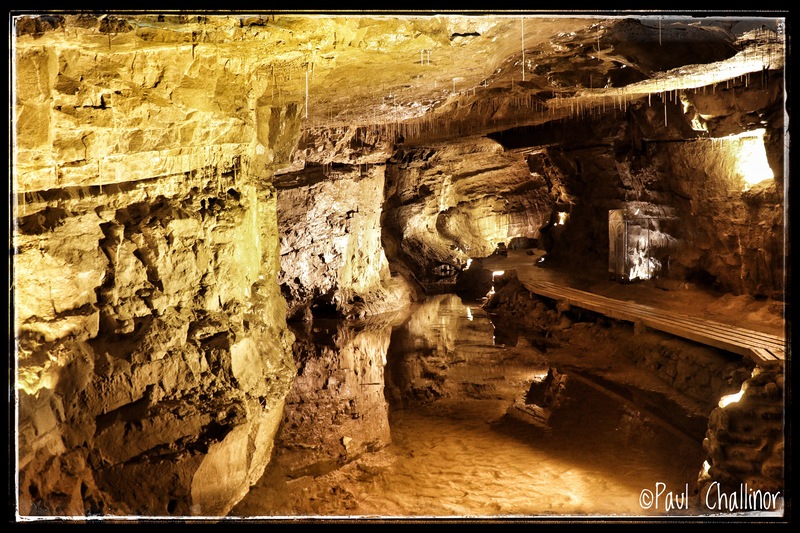 Dan yr Ogof, in it’s literal translation is “Under the Cave“. So you need to be careful and not call it Dan yr Ogof Caves, or you’d be repeating yourself. The cave system was discovered, or more accurately rediscoved in 1912 when Jeff and Ashwell Morgan undertook an exploration beyond the cave entrance where the Afon Lllynfell emerges from the hillside. The Morgan Brothers found a small passage that led up to the dry cave above. They named the cave Dan Yr Ogof after their farm that sat below the cave. The cave was explored up to the start of the lakes by use of a coracle to pass some of the pools on the way. Very different to the more sophisticated approach with modern equipment today. The cave system behind the entrance is known to stretch over over 17km, but estimates place the whole system as double this. Much of the complex is only accessible to fully decked out covers, but for the less intrepid of us wetsuits, torches and hard hats are not required. Ive been caving once at Natgarw, and this experience demonstrated that I am not the right size for caving. I’ll take the easier option every time! As a visitor there is access to three main caves: the longer cave system called Dan yr Ogof with the entrance just above the Afon Llynfell, the Bone Cave and the spectacular Cathedral Cave. There’s a great interactive website that shows the extent of the explored areas of the complex along with photos at ogof.org.uk. We went into the main complex first, and this is made up of occasionally narrow and low caves carved out of teh living rock by the actions of the underground rivers. The place was heaving with people and kids when we arrived. 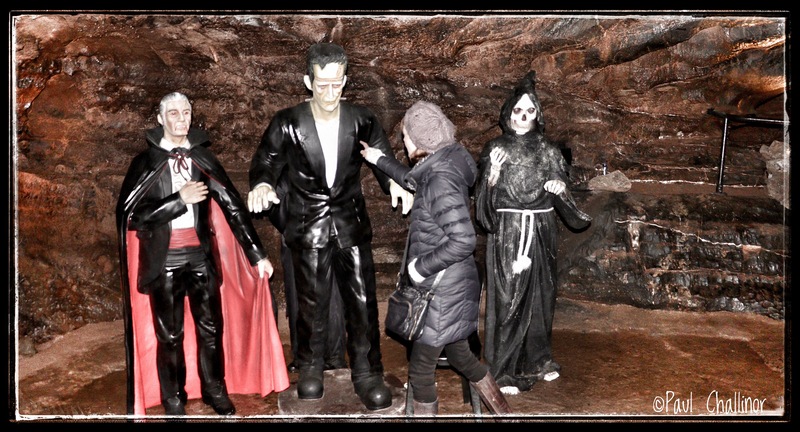 Far more than we anticipated, until we realised that the caves had been decked out for Halloween. As we walked through the caves there were squeals and screams from the kids. Aunty had to make sure that nothing was going to jump out at her before agreeing to pose for a photo. It’s not possible to take a tri-pod into the caves so the photos are not as sharp as I would have liked, made even worse when I realised I had switched off the image stabiliser. Duh! The caves at Dan-yr-Ogof are made of carboniferous limestone, formed some 315 million years ago, when the area lay to the south of the equator and was covered by a warm shallow tropical sea. Shellfish corals and numerous small creatures lived in these waters. When they died their shells and skeletons sank to the sea floor. They were the source of calcium carbonate, the raw material for limestone rock. Over millions of years these calcium carbonate muds and sands have been deeply buried and transformed into limestones. Plate tectonics have moved this part of teh earth’s crust to it’s present position north of the equator, and subsequent ice ages have eroded the mountains away. When the Morgan brothers came across this structure they named it The Angle. And it’s easy to see why. During the Ice Ages polar ice caps and glaciations in the mountainous regions locked up vast quantities of water on land, reducing sea level dramatically when compared with today. 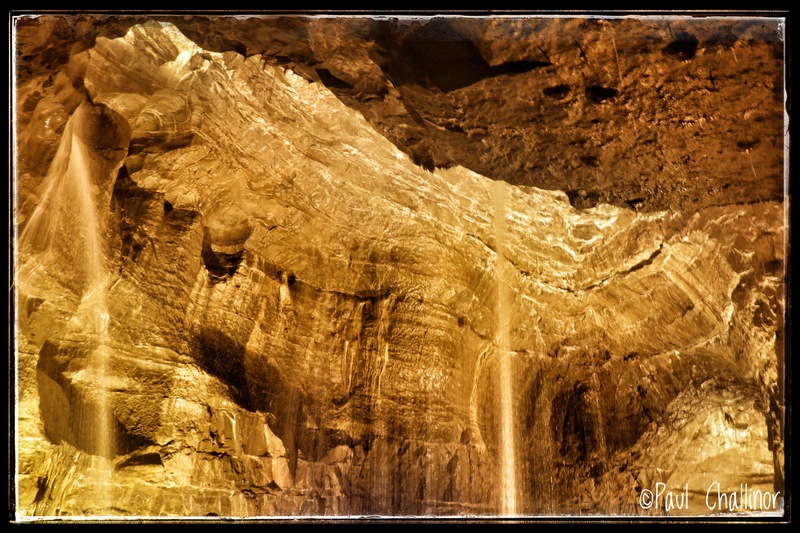 Over the millennia rivers cut deep into the rocks forming gorges and waterfalls. The rivers running underground in the caves cut new passages at lower levels and abandoned the higher levels. Cathedral cave is an abandoned higher level. 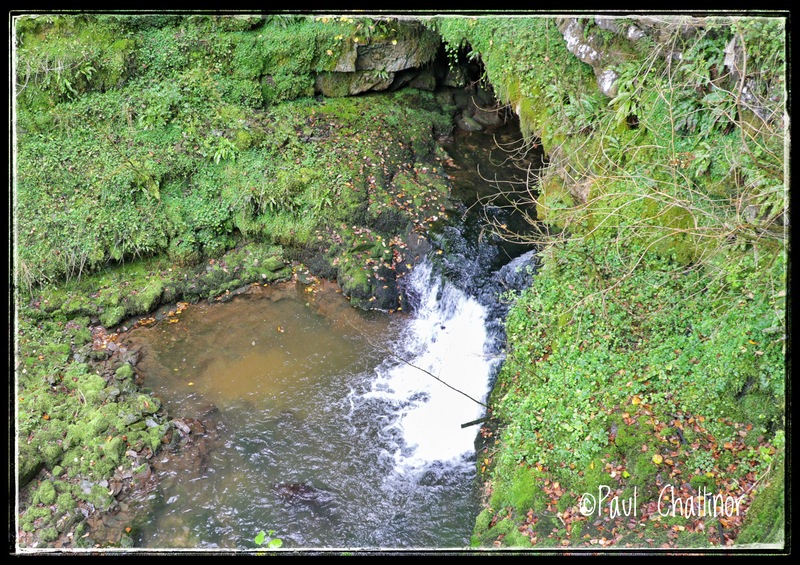 The show cave of Dan yr Ogof is formed in one of these lower levels and the river is still cutting its way down to form even lower cave passages. Above ground teh ice came and went, but below ground the melt water continued to carve dep into the rock. Creating level upon level of caves. 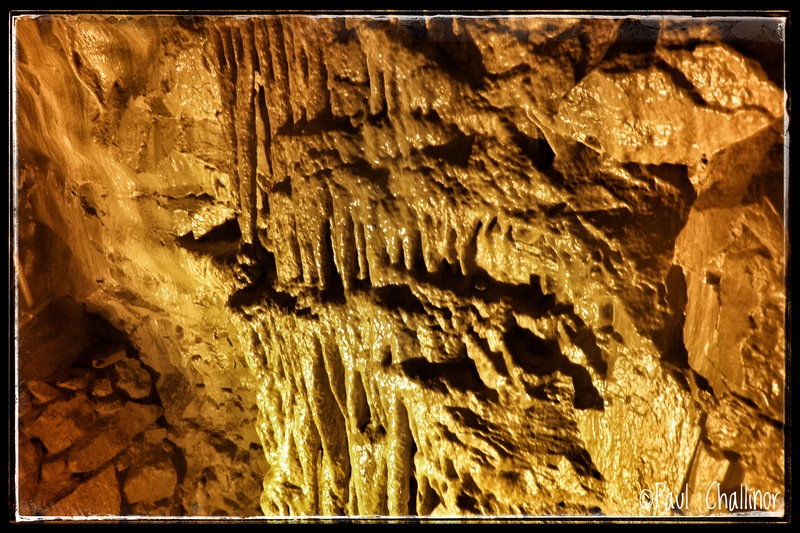 As water dripped from teh roofs, and flowed down teh walls stalactites and stalagmites were formed. Today we can now wonder at the seemingly ageless process that is still going on today. My small mind certainly struggle to comprehend the years that have passed, nor can it appreciate the slow but relentless creation of the fantastic shapes we now see in the caves. 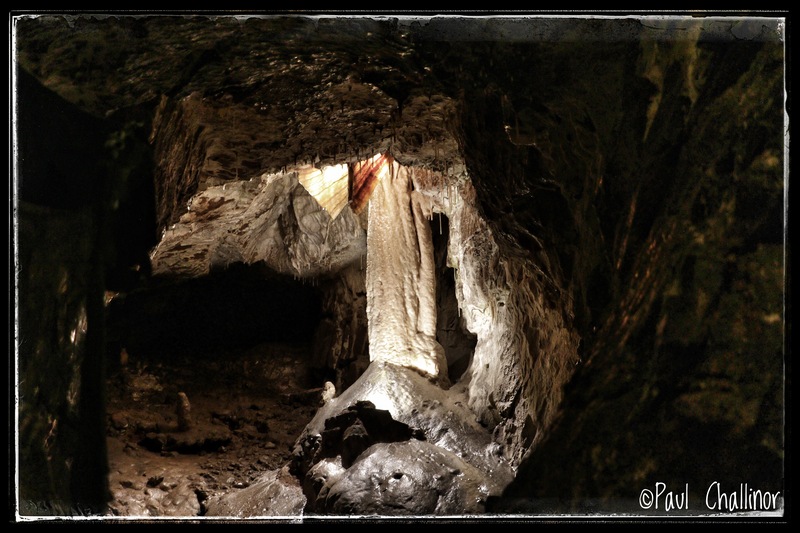 After wondering around the winding narrow chamber of the Dan yr Ogof caves we next visited the Bone Cave. Even today this is not easy to access, requiring you to don a safety helmet and walk along a narrow path protected from rock falls by tin roofs. How the ancients used this place is difficult to image. But compared to the other caves, this one is dry, but maybe doesn’t come with all mod cons that we would expect today. The Bone Cave is so called because over 42 human skeletons have so far been found here, with many of the bones dating back over 3,000 years to the Bronze Age. The oldest bone to have been found in this cave is of a red deer, over 7,000 years old. More recent traces of human occupation have also been discovered here, from the second and fourth centuries A.D. The finds include early and late Roman pottery, iron, bronze and silver rings, bone pins, a brooch and some coins. The nearest Roman camp to Dan yr Ogof was at Coelren, while another camp was situated at Y Gaer, just outside Brecon. 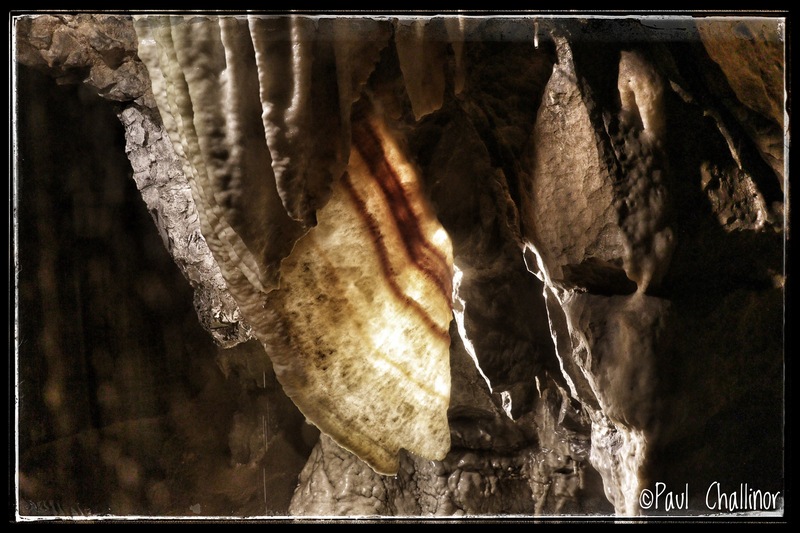 Then it was on to the main show piece – the Cathedral Cave. This is entered lower down the hillside from the Bone Cave, but higher than Dan yr Ogof. Once you’ve got past the false cave paintings near the entrance the wide gallery like procession into the Cathedral itself is still impressive. All around you the incessant sound of running water reminds you of the true architect that has been working here for thousands of years. Look carefully and see if you find the water surface in the photo below – no prizes. The Cathedral Cave is the terminus for this section and is too large to get into a decent photo. 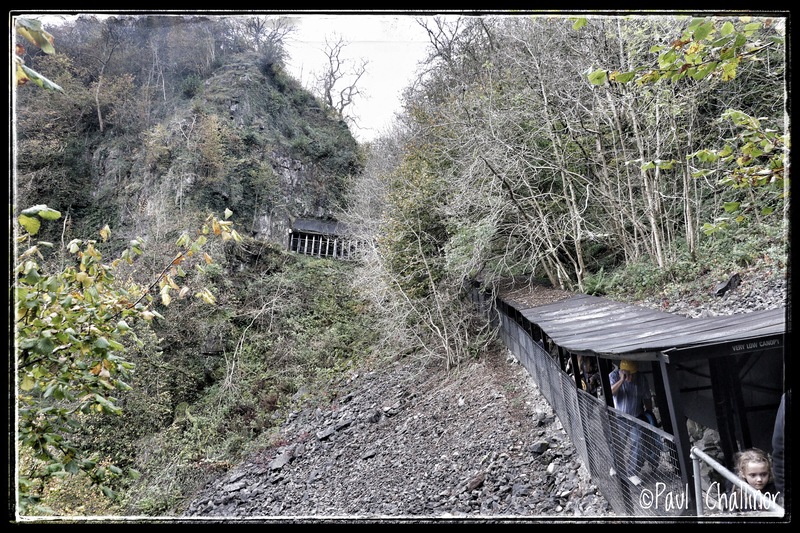 Right at the end is small cage where it is possible to get married as Dan yr Ogof is a registered site for marriage. Not sure about births and deaths though. Also not sure about the symbolism of teh cage where the couple and registrar conduct the ceremony. The circular hall creates a dome high above you, creating a sense of space. At regular spaces just below the roof water falls pour out continuous streams to crash on the cave floor below. The noise is constant, but only adds the majesty of the scene before you as you gaze in wonder at the simple power of water to create such a space. 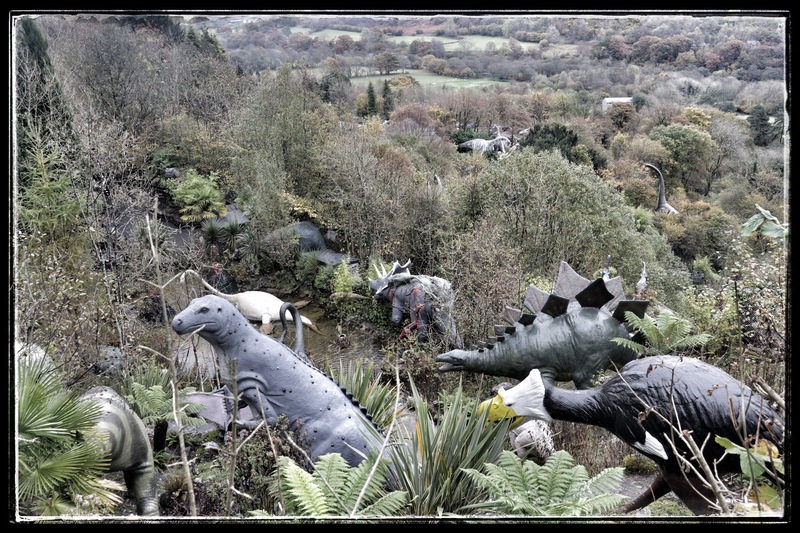 One of the fantastic things about Dan yr Ogof is the eclectic nature of the place. You wonder through caves and chambers that have been carved out of living rock over countless years by nothing more than running water. Then as you come out of the Cathedral Cave and look down into the valley below, you are confronted by dinosaurs. It could be tacky, but from some kitsch reason it seems to work. Last time we were here there were only a few, but Jurassic Park has been transported from a mythical island to the centre of Wales. If you get the chance please visit it. there are things for grown ups, kids and adult kids here.